US stocks suffered their worst fall in more than six years yesterday amid heightened concerns of higher inflation. The S&P 500 fell 4.1%. Over in Europe, the Stoxx 600 fell 1.7%. The Vix volatility index, known as Wall Street's fear gauge, hit 37.32, its highest level since the Chinese currency devaluation of August 2015. Bonds found some support with the US 10-year yield down 14 basis points to 2.71%. At the point of writing, the Nikkei is down 5.1% and the Hang Seng has declined by 4.0%. If investors had appeared solely focused on signs of stronger economic and earnings growth during the first four weeks of 2018, they now appear solely focused on fears over higher interest rates. While markets may remain volatile in the near term, Citi analysts feel more comfortable putting new money to work now, given higher yields and volatility. Apart from lower investor complacency, the fundamentals have not changed. 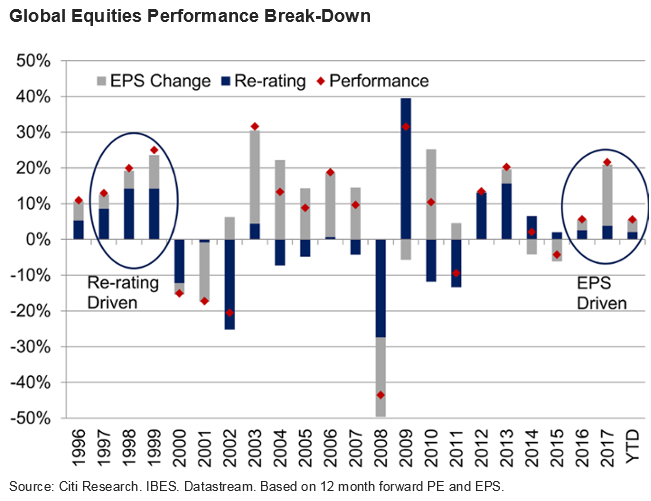 Citi analysts note that unlike in the late 1990s, the global equity rally has been driven more by earnings than a re-rating of valuations. See chart. While last Friday's higher than expected US wage growth report stoked inflation fears, Citi notes that higher wage growth helps support consumption and growth and has historically led to higher earnings growth. While Citi believes that wages and inflation have bottomed in the US, they continue to expect inflationary pressures to be contained. Citi's forecast for US inflation is 1.9% for 2018, up from 1.7% in 2017. So what does this mean for investors? Citi continues to view markets dips as buying opportunities. Markets and sectors that offer strong earnings momentum and reasonable valuations include the Emerging Markets (EMs), as well as the global Financials and Materials sectors. Although emerging markets (EM) equities could experience heightened volatility as the US dollar finds support in the near term, but valuations and fundamentals remain attractive over the medium term. Emerging markets are currently trading at a 30% Price to Earnings discount to the US and earnings are expected to grow 14.7% in 2018. Over in Europe, economic growth is broadening to encompass all sectors and euro area member states. The euro area's economic sentiment index reached 114.7 in January, close to an 18-year high. While euro appreciation may slow in the near term if the US dollar stops falling, Citi analysts doubt that the recent euro strength can derail the recovery in the Eurozone. Citi's analysis suggests that the stronger euro is more likely to temper European inflation than European growth. While Italian election and German coalition issues could weigh on performance in the near term, Citi analysts expect this to pass in the coming months. Europe is currently trading at a 20% discount to the US and Citi sees upside to current consensus earnings growth forecast of 8% for 2018. Within sectors, higher 10-year Treasury bond yields may mean that Financials outperform Technology, although Citi currently remains overweight on both sectors. Leadership changes in the market typically bring about volatility but investors may not want to ignore the opportunities that the recent correction brings. As for fixed income, Citi analysts are assessing the new range for US bond yields. If yields stabilise, they may be looking for opportunities to gain exposure to higher duration good quality bonds. For foreign exchange or FX focused investors, expectations of continued volatility bring about tactical opportunities. Citi analysts believe that there could be demand for safe haven currencies such as the JPY, CHF and Gold. The USD is likely to remain supported against the commodity and Asia emerging market currencies as well as the GBP. While markets may remain volatile in the near term, Citi analysts feel more comfortable putting new money to work now, given higher yields and volatility. Apart from lower investor complacency, the fundamentals have not changed. Citi analysts note that unlike in the late 1990s, the global equity rally has been driven more by earnings than a re-rating of valuations. Within sectors, higher 10-year Treasury bond yields may mean that Financials outperform Technology. Leadership changes in the market typically bring about volatility but investors may not want to ignore the opportunities that the recent correction brings.